[LED] Gorgeously clean Lake Seymour was ideal for a sleeveless wetsuit swim at about 68-70 degrees. The start was funny; we were all standing around chatting while the race director was trying to get our attention by yelling that we could start now. Smooth for first loop, choppy for second. We had to get out between loops and touch a table loaded with Cliff bars and Heed. Race support and volunteers were super encouraging and talked to us in transition. [NR] Since there were only 16 people in the race, we each found ourselves more or less alone pretty quickly, which was a totally new scenario, but very relaxing. There was a kayaker in close proximity the entire swim, which made me feel totally safe. The scenery made me feel like a kid again, carefree and clowning around in the summertime. Swim felt pretty strong, although it took me a while to get my “land legs” back under me after. [KS] A 3.5 mile swim? that sounds insane. Sign me up! Still, I was so nervous about it, standing on the beach I could have crapped myself. Pee in wetsuit-OK. Poop-not so good. But as soon as we started I knew I’d make it...so fun not to have hundreds of people on your head. The kayakers were used to doing the several long distance swim races RD offers and I found I could just swim without sighting as I’d hear ‘keep right’ etc from the experienced kayakers. It was a beautiful pristine lake and gorgeous scenery. Was so surprised how much I enjoyed the whole swim. [TK] I knew the swim was going to make for a long day. It was 2 loops of 1.75 miles each. Krista got the word that we could bail on the 2nd loop if we needed to (and still go on to the bike). The water was beautiful and the swim was peaceful, but a nausea was setting in as I swam the last 0.3 mile of the 1st loop. Too much sighting and flipping my head about. I was thinking about bailing on the 2nd loop. I was also reminding myself that this was a team effort, and that Laurie was going to suffer through the entire run (her biggest challenge of the day). The volunteer told me that everyone went out for the 2nd loop… Then she sent a kayaker to be my personal guide - so I didn't have to sight as much. The kayaker guided me through the cove for an additional 1/2 mile (thanks!!!). I was choked up when I finally got out of the water. I thanked the volunteer for talking me through my moments of doubt. Even the volunteer was getting choked up. [TR] Knowing that Dori was swimming across the Channel made me think 3.5 miles should be no problem, so inspiring.With the awesome kayak support I had so much fun as I felt safe the whole time and I could have done another lap. I felt like a kid playing around dolphins, that is how cool that swim was! [LED] I was unprepared for the wind and the hills, but could not stop gawking at the beautiful scenery and all the cows! [NR] Ditto on the wind and hills. My feet were so cold! The scenery was unbelievable and very little traffic - minus some big trucks. :) I have to say....I think Vermont cows are more happy than California cows! If I had seen a moose, it would have been grounds to stop and take a picture.....we all carried our cell phones on our bikes since it was a new race with so few participants. The first 5-10 miles before we turned into the wind, the road was completely smooth and very very fast...loved it! [KS] Thought this would be a breeze. Well windy it was! also surprised at how strange it felt after that long a swim....actually looked down several times as I was sure I had the wrong bike! Just felt so awkward at first. It was cool and wore long sleeve BTT top which acted as a sail, bad move and also need to eat more before the swim as I was pretty hungry right away. [TK] The bike was windy. That's all I can say about the bike. Head wind is a bummer. Just wanted to get through the bike. The flaggers were great in their full-on orange jumpers. [TR] Yes it was windy but the scenery spectatular...the meadows, the cows, you have to see this for yourself. PS I love cows..
[LED] I was misdirected by a flagger and ran 3+ miles of the sprint course wondering where all the advertised water stops were. The race director himself picked me up in his truck and transplanted me to the correct, very hilly 13.1-mile course. Who knows what my real time would have been. Four dogs chased me down including a three-legged one, and I was offered an ear of corn by a farmer. Oh, the hills! But I did it! My first half marathon. It helped knowing that the rest of my BTT mates were out there facing their own personal challenges, too. [NR] I think this is where the true adventure began for a lot of us. There was a little confusion with small direction signs and lackluster flaggers. I stopped at some point to pull out the run map from my back pocket to ensure I was on course......I was so tired, I didn’t think I could run a foot past 13.1 miles. :) Luckily, I avoided the dogs. The hilly course took us in and out of deep woods and through farmland all on a dirt road so almost no traffic. I’ve been told that the course is even prettier during the Dandelion Half when everything is in bloom. Again, such a fun course made me feel like a kid again even though my legs were screaming. Oh, and the water station volunteers were awesome.....think about volunteering for a race where there are only 16 people completely spread out.....yikes!!! [KS] Had no idea what would happen...as all this last year my one leg just would not move right, several Drs, neuros, EEG, spinal tap...no real diagnosis....I thought Id start and see what happens. Ran with Terry and after 3 miles of dragging my leg...it started to work! so weird and great! It was a stunning course, reminded me of the dirt roads and hills of the Vermont 100 so we did it ‘ultra’ style, walk the hills, run the rest. It was great to do this with Terry. [TK] I love when you pull into T2 and half the field is already showered and eating burgers. Noteables of my run. (1) I missed a turn and was driven back to a point… that point was 0.22 miles further along than I had actually run. This tormented me the whole run, wondering if I should make it up or not. Considering that I swam an extra half mile, cutting the run short by 0.22 mile would be fine. At mile 12, I heard that Krista and Terry were just 30 seconds ahead. I didn't feel right possibly passing someone when I had cut the course short, so I doubled back 0.11 mile to make up the distance. (2) HILLY - very hilly course. Calling all billy-goats, here is a race for you. The hills never ended. Finally there were a few really steep descents. [TR] I was not sure I could run at all. I knew I could walk it but didn’t want to do that. Krista and I went into the ‘run’ together promising that we’d do it together; we both had issues that should have called off the run. But we did it! and ran in those beautiful roads in Vermont, BTW hilly! [LED] Beautiful course, very laid back race but a bit lonely with only 13 of us finishing. BTT had the largest presence and won a weekend at a ski resort, 2-for-1 lift tickets, and a very large stick to be photographed in a Boston bar. The race was emotional for most, if not all, of us. I’m in for 2011. [NR] Hands down, I would do this race again. It was such an adventure and so off the beaten path as well as being a huge challenge. It is a bit lonely, but pretty cool when everyone reunites at the finish. The race director is fantastic and very personable. It was an awesome weekend for BTT....every person who raced had a personal triumph in some form or fashion. [KS] One of my new favourite races and I will be back for sure. The beauty of the course and the support was outstanding. I loved being part of something that felt so special, as it was a brand new race, crazy distances, and everyone there had something to overcome, or a new personal challenge, and we all did it. Just love adventures like this one. [TK] Overall, I think this is a great race concept. With the “team” element/division, I felt like I was racing for the team. Although I wasn’t fast, finishing this was the challenge for me. I really need to work on my swim before next year. The race staff and volunteers were wonderful. This race and the whole weekend leaves me with a warm feeling. I'm in for next year. [TR] Loved everything about this race and it’s the new one I think we will go to every year. The title fell off. 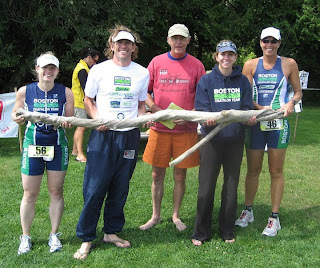 This race report is from the Aquaman Even Up Triathlon in Derby, VT. 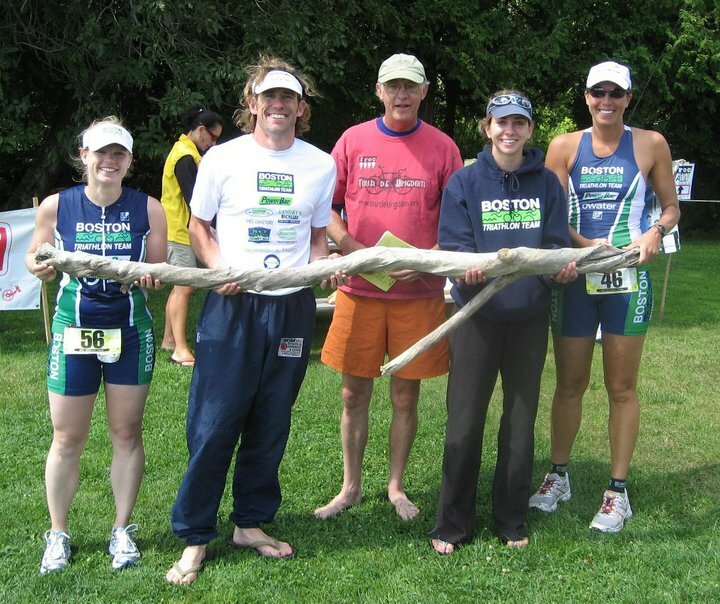 The people in the picture holding The Stick are Nikki Reading, Joe Kurtz, Phil White (race director), Audrey Perlow (did the sprint race), and Laurie Damianos. Not pictured are Krista Schepanovsky, Trish Kelly, an Terry Reagan.